Burrowing Owl, the 140-acre property that sits at the crown of the Okanagan’s Black Sage Bench’s Road 22, has a new winemaker. His name is Bertus Albertyn. 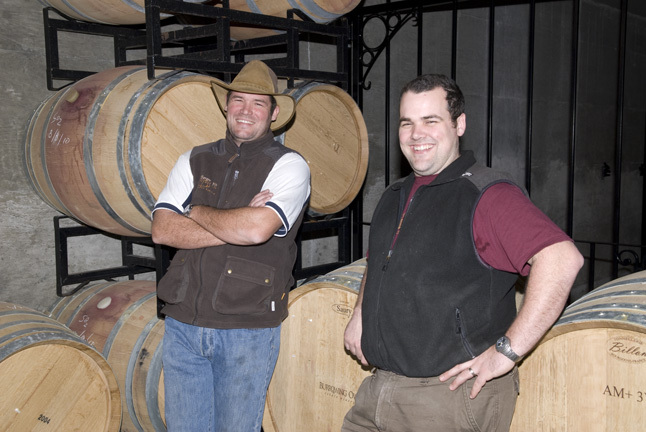 Bertus is a South African native married to a Canadian physician who took his post at the South Okanagan property, owned and run by Chris Wyse, in January earlier this year. There he will make the wine from the 125 acres of vineyards under cultivation that produce approximately 30,000 cases each year. Mind you, even at this volume of production, relatively large for the Okanagan, you’re likely only to be able to find a bottle of Burrowing Owl, nearly any variety, any vintage, at the winery’s wineshop itself or at select restaurants in B.C. There’s just too much demand for it to be able to keep the VQA liquor stores continually stocked. Since we’re thinking there might be just a little bit more to winemaking than that, we cajoled Bertus into talking to us a bit longer to see what gives. 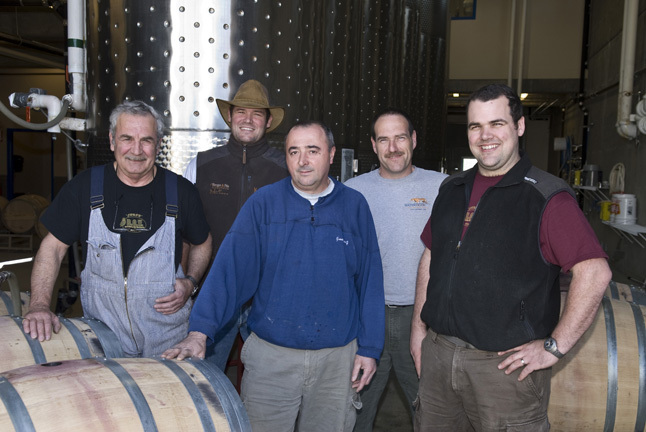 Fernando Bottoni (long time cellar worker), Bertus Albertyn, Joey Matias (long time cellar worker), Emmerick Keller (Plant Manager) and Scott Stefishen (Assistant Winemaker). Missing is Pat Johnson. Photo by Gord Wylie. Bertus Albertyn looks – and is – still young but has a lifetime of grape growing under his belt. 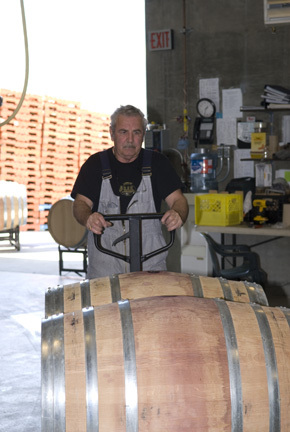 He has a degree in Viticulture and Oenology. 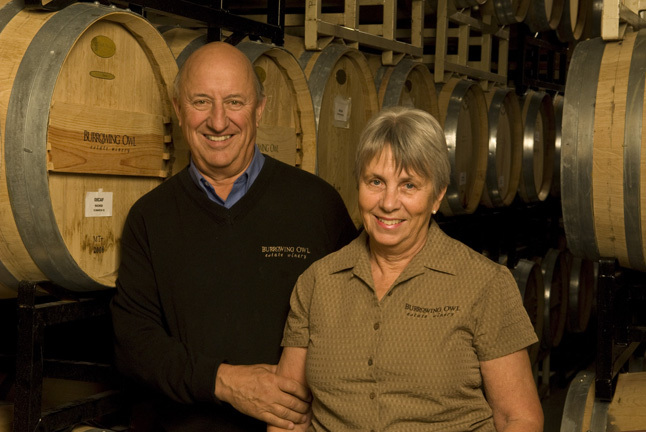 He worked at two vineyards in South Africa, the Wellington Cellars, a large operation that bears the same name to the Wellington Wine Growing Region in South Africa and which “produces as much grapes there as in all of Canada;” and the Avondale where he learned organic winemaking and vineyard management “approved by Mother Nature” at this small family-owned winery. 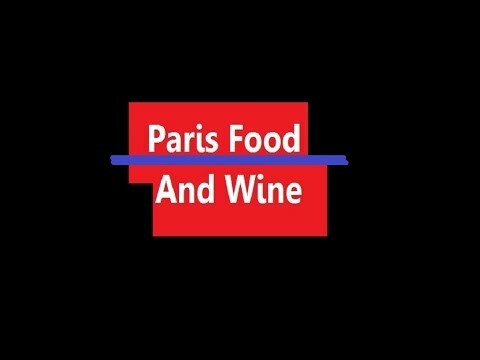 While working in South Africa he did a vintage in Sonoma, a vintage in Italy outside of Venice, and two in France, one in Crozes-Hermitage at Alain Graillot, and the other in the South of France, Domaine Des Anges. 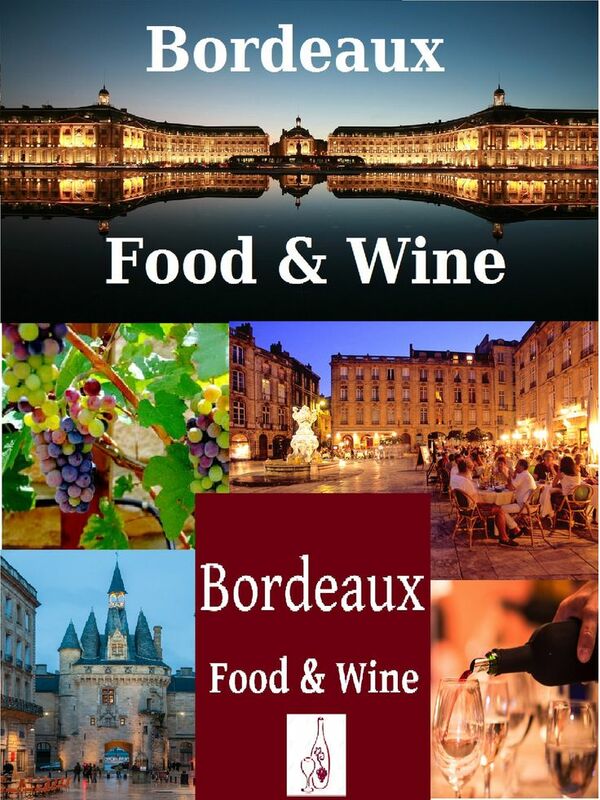 “I did the harvest in France, Italy and America while I was working South Africa. I would do a crush every 2 years in a different part of the world to broaden my knowledge of winemaking. This also helped me to broaden my vision and taste,” Bertus told us. So the fact that the seasons in Canada are inverted to the seasonal changes in South Africa doesn’t phase him; it’s something he’s learned to work to his advantage. Of course, it really all begins during the harvesting and then the crush. “We’re lucky here because of the cold nights. The grapes go into the cellar cold. When you can start at a low enough temperature then they can’t peak very high. It’s important not to let the temperature go up to 35 c. – that can kill your yeast. If you can increase your temperature during fermentation, you double your ability to extract,” he explained. “We’re not changing anything. We’re just taking out the debris. We’re just doing a better job. Leaves are a very bad thing because they’re green. We’re destemming. But we’re not totally crushing. And of course we use only ripe grapes. No green grapes,” he said with a laugh. For his white wines he’s also fond of a more “old-world” style of wine making. He’s quick to point out that South Africa has a long heritage of grape growing. One of the wineries where he worked dates itself back to 1693 when it was established. “Our whites are whole-bunch wines. We do no de-stemming,” explained Bertus. “The stems are actually used as a filtration system to yield cleaner wine. Our pinot gris and chardonnay are all more old-world, lightly settled and have a ‘darker ferment.’ With a dirtier juice you have more flexibility in fermentation. More glycerines give more body in the wine. New world wines, for example, are all de-stemmed. That creates up-front fruit flavors.” Bertus went on to explain that the whole bunch press delivers a juice with a lower solid content; cleaner juice, in fact, than destemming. Burrowing Owl Vineyards is also known as a green winery. 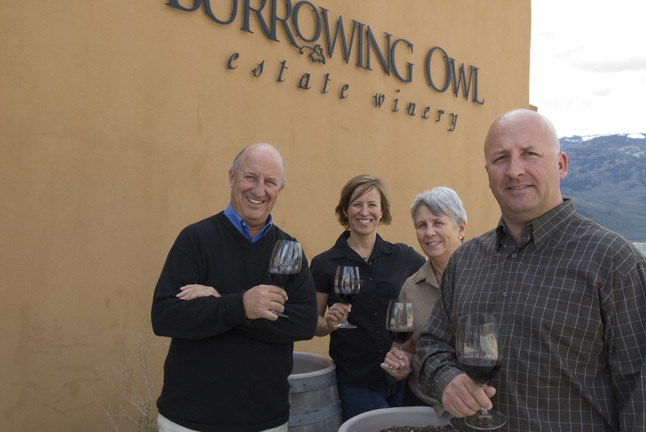 Named after the regionally endangered species of Burrowing Owl, when Midge and Jim Wyse purchased the vineyards in ’93, they created a custom of donating $2 for each tasting at the winery. That $2 goes towards South Okanagan Rehabilitation Center For Owls and to the Burrowing Owl Conservation Society of B.C. They’ve donated more than $250,000 to date. Re-use: All wine bottles used in the wine shop and in the restaurant operations are cleaned out and re-used at the winery. They use an alternative pest control system. And The Sonora Room, the on-site restaurant, adheres to a less than 100-km local food supply philosophy, a philosophy and a tradition at the Sonora Room that their new Executive Chef team will continue on beginning May 1st when they re-open for full time summer season hours.